I’ve seen Krapp before, and that time it lived up to its name. On a two day run, I went the first night and was suitably unimpressed. I consequently heard that the second night…the tape broke. Needless to say, Michael Gambon’s tape didn’t break. 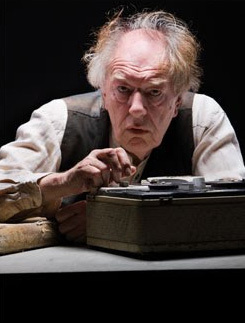 Maybe it’s the fact that I’ve seen both of my grandparents detoriate through old age and death since I saw Krapp for the first time, that made last week’s performance at the Gate all the more poignant, and maybe it was Gambon’s stellar performance. Keeping very much to Beckett’s script, there was only the minor addition of a childish joke with a banana symbolising a phallic symbol. The jury is still out for me on whether or not that suited Krapp’s character, it seems a bit too much on the sleazy side. Bananas aside, however the performance was perfectly placed and I felt positively archaic coming out. I could feel the old age creeping into my young soul, I could feel the arthritis, the short term memory slipping away, and the concentration on old memories creeping in. That’s when a production is really effective – I felt hungover coming out of Conor McPherson’s The Seafarer, dying for a drink coming out of Harold Pinter’s No Man’s Land and reborn coming out of Marina Carr’s Woman and Scarecrow, Krapp’s Last Tape made me feel world weary but at peace. Michael Gambon’s Krapp explores his face constantly searching for the younger Krapp, searching for that young, love lost man, but can only find fading memories amongst all the wrinkles. I feel that, of any playwright, Beckett’s work always manages to really capture the despair of the human soul and Krapp’s projects the loneliness of old age. You could get depressed quite easily, at this play, but perhaps instead we should celebrate the joy of “spool” and the love Krapp enjoyed, all the while realising that life is brief and must be enjoyed, each moment as it happens. That notion of life experience changing your reaction to Krapp’s Last Tape is definitely something that occurred to me too. I love the idea of these physical reactions to watching great plays / great actors. I probably feel infirm and in need of a drink at the best of times, but I know what you mean! Finally, that linking of physical gesture to thought and reflection is a good one!